In a private meeting or at a public event. We have the right room for you! An ideal room for your team work with a view of the Tessinerplatz. Here you have direct access to the coffee bar. A short meeting for two or rather a team stand-up early in the morning. The smallest room offers enough space. Did you find a room and want to book catering for the day? Choose this room for your presentation with the team. It also offers space for table discussions. The room is ideal for a weekly team meeting on a smaller scale. The whiteboard wall brings order into the room. Smaller workshops or brainstorming in a team with a couch setting. The cosy room is ideal. 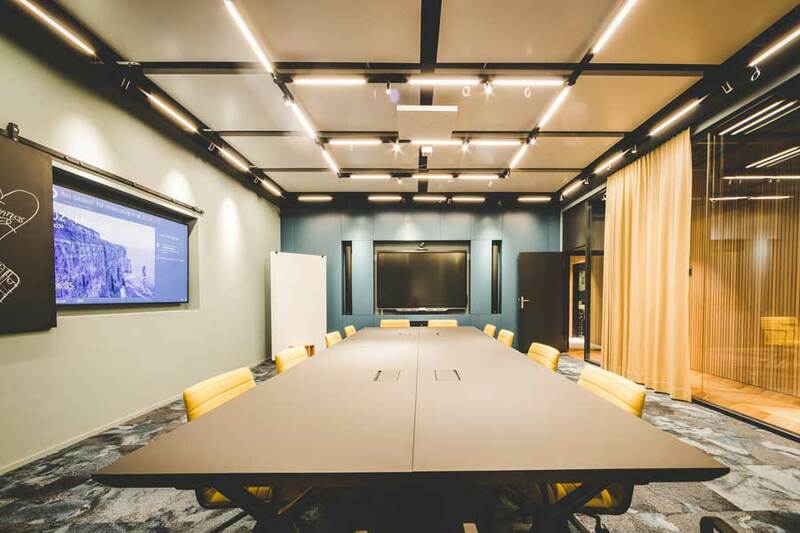 The largest room, equipped with a large smartboard and a digital screen as well as the best digital equipment, offers space for ideas. The design of our multifunctional event space is aimed at maximum flexibility - with a modular stage and the best light / audio settings.